Summary: In the past Walna Scar was known as Walney Scar but the name has changed over time. The fell lies to the south of the road of the same name which was used to transport slate and goods between Coniston to the east and Seathwaite and the Duddon valley to the west. 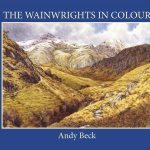 Wainwright did originally consider including Walna Scar as one of the fells in the Pictorial Guides as he included it on both his first and second list but it didn’t make the final cut. This may be due in part to the fact that he made the Walna Scar road in this area the defining boundary of the southern fells and this fell sits to the south of that line. Book four of the Pictorial Guides – The Southern Fells was also full to capacity so including Walna Scar would have been impractical. The high ground of Walna Scar extends south to two other high points, White Maiden and White Pike, in other chapters of the Outlying Fells book AW may have indicated these as other tops worth visiting but not so in the Walna Scar chapter (see points of interest below). Topographical detail: Wainwright gave the fell a height of 2035′, most likely taken from the 6 inch map of the day or the 1 inch Bartholomew map, other contemporary maps did not give Walna Scar a measured height. In more recent years it has been resurveyed to a more accurate height of 2037′ 621m. The summit is marked by a small rough cairn (see below), the Wainwright summit. 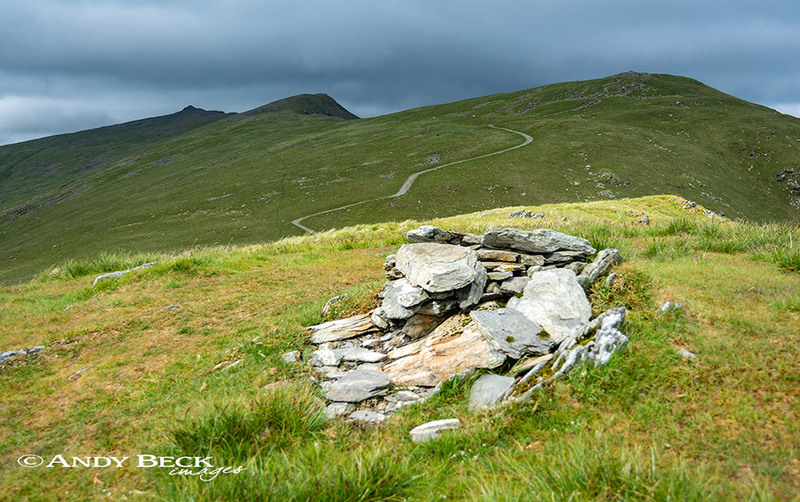 Points of interest: The high gound of Walna Scar has three distinct tops, Walna Scar itself, White Maiden and White Pike, both of which are lower than Walna Scar but they are listed on other fell lists, both are worthy of a visit especially for their views over the Duddon estuary. Also worthy of exploration are the large excavations of Walna Scar quarries on the west side of the fell. These slate quarries are now disused and being reclaimed by nature. As with all such locations care must be taken when exploring. Tarns: There are three decent sized tarns in the proximity of the summit ofWhite Maiden, none of which are officially named. Adjoining fells: Apart from White Maiden and White Pike mentioned above there are fells connected to Walna Scar to the north, these being Brown Pike which leads up to Dow Crag. Nearest facilities: To the west there is very limited parking (free) on the lower section of Walna Scar road, do not block the narrow lane. Food, drinks and accomodation at Seathwaite. To the east there is parking space (free) at fell gate where the Walna Scar road turns from tarmac to rough track but this is a popular parking place for those undertaking the Coniston fells. On this side Coniston village has all the required facilities, Torver has also 2 pubs. 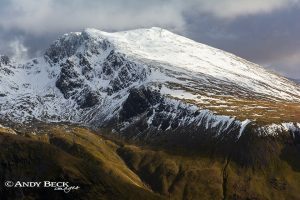 Star rating: (1.7 / 5) The summit of Walna Scar is fairly unassuming but by adding on White Maiden and White Pike more interest is gained. Walna Scar quarries add to the rating.